Aberdeen captain Graeme Shinnie is holding talks with Derby County over a summer transfer. The 27-year-old’s Dons contract is up at the end of the season, and while the Pittodrie side are keen to keep the Scotland international in the north-east, there has been no shortage of suitors. Rangers, Sheffield United, Hull City, Bristol City, Sunderland, Wigan Athletic and Luton Town have all been linked with Shinnie in the last few months. Derby manager Frank Lampard took in Aberdeen’s recent Ladbrokes Premiership win over Motherwell, and is understood to be keen on signing the versatile midfielder. Shinnie is suspended for Sunday’s William Hill Scottish Cup semi-final with Celtic, and travelled to Pride Park this week for discussions. 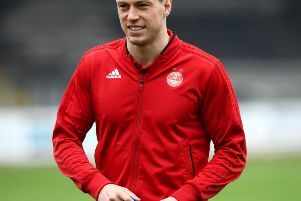 He has played every minute of the current campaign and has made more than 180 appearances for Aberdeen since joining from Inverness Caledonian Thistle in the summer of 2015. 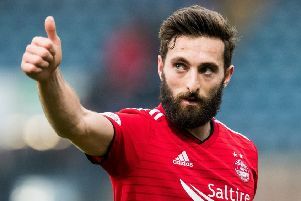 Earlier this year, Aberdeen manager Derek McInnes admitted he was hopeful Shinnie would stay at the club, adding: “There’s no doubting his love for the club and his pride in being captain here. “We’re hanging on to that and hoping it can be a huge part in any decision he makes”. Derby have a number of Scots on their books already, with Ikechi Anya, Craig Bryson, Craig Forsyth, Chris Martin and Calum MacDonald all part of the first-team squad.